Vocations in the Diocese of Salford is a real priority. We are privileged to have a number of priests, religious and lay people directly involved in supporting the vital work of encouraging. Under Bishop John’s encouragement we are encouraging all young people in the Diocese to regularly ask themselves : “What is God asking of me?” It is hoped that we can create a culture of vocation within our parishes and schools so that our young people are confident with the guidance that their faith can give them as they make key decisions and choices about their future. Fr John Hitchen is the Vocations Director. Fr John works with those who having completed a time of discernment now wish to make an a formal application to the priesthood for the Diocese. Fr John continues to accompany our seminarians through their time of formation up to ordination. 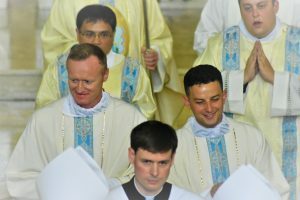 In July, we had two ordinations to the Diocese: Fr Gavin Landers and Fr Mark Paver. Rev Callum Brown was ordained in June as a Deacon. 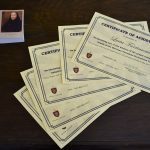 Bishop John recently has accepted new men to begin training for the priesthood for the Diocese. This is an exciting time for Salford Diocese and it is good news that we wish to celebrate. Fr David Featherstone is the Vocations Promoter who continues to be the first point of contact for those considering a vocation to the diocesan priesthood. He meets regularly on an individual basis those currently seriously discerning the priesthood with the Diocese. Fr David and Fr John continue to work closely together with very regular contact. The vocations discernment group meets with every 6 weeks or so for a meal at Urmston. Fr John Hitchen also attends these meetings alongside Fr David. Bishop John gives great support to this work and his presence at these meetings is invaluable. The meeting comprises an input and Evening Prayer in addition to the meal. The input comprises inviting a different speaker (usually a diocesan priest) to come and share an aspect of their vocation or ministerial experience. This continues to be appreciated and allows our enquirers to get to know each other. In the last few months our speakers have included: Bishop Brain, Archbishop Kelly, Fr. Ged Murphy, Fr Michael Cleary, Fr Patrick McMahon and Fr Philip Caldwell. The Vocations promotion team is working well together, this consists of Fr David, Lorraine Leonard, Sister Teresa Wild and Fr Joseph Gee. We met with Bishop John to gain his support for the projects we wish to undertake. These include a revised vocations prayer card: arranging for there to be a Diocesan Vocations Mass in each of the deaneries in 2017: commissioning a dvd on priestly vocations to be produced for the Diocese as well as enabling a group for young people to come to pray and reflect about their lives. We have been involved in a number of careers fairs~ notably at St Bede’s college and Loreto 6th Form College and St Ambrose College which we have staffed and provided resources such as vocations pens, leaflets and prayer cards. 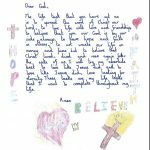 This gave the young people a chance to think about what God might be asking of them. 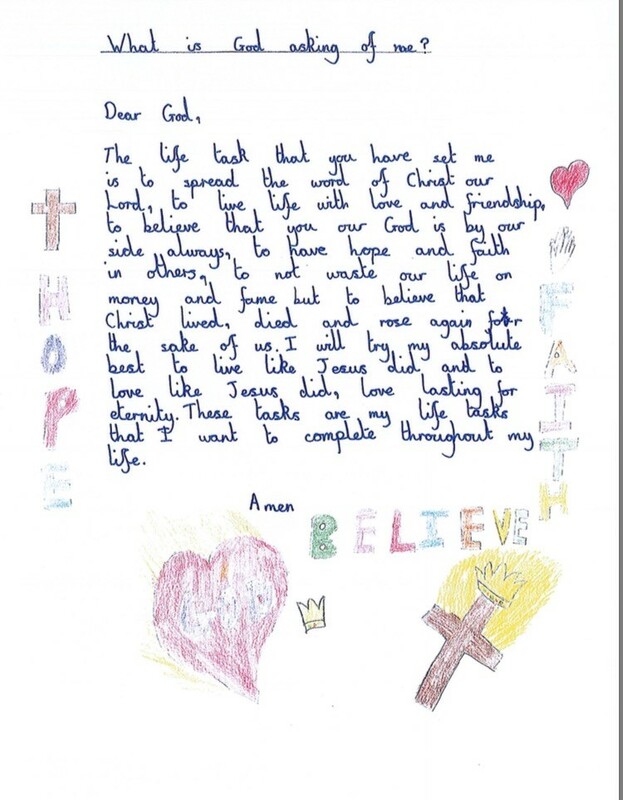 This year we ran a competition for schools to design some posters with prayers for vocations for children to be used throughout the Diocese. Over the last few years we have organised a Day for Altar servers as we feel there is a correlation between this important ministry for children and young people and vocation. These events have been well supported and appreciated by the both the parishes and the young people. We continue to run the Vocations prayer calendar. This has been going for ten years now. We have been asked on a few occasions to provide resources for these days on which schools, religious houses and parishes promote and pray for vocations to the priesthood and consecrated life. Members of the team have also been invited into diocesan schools to give an input on vocations.